I believe I've fallen in love with army green! In the past couple years, I've gradually incorporated the color grey into my wardrobe, and so far… I'm still wearing it. But his year, I'm finding myself more attracted to army green. Many years ago, back in Honduras, I used to see too many soldiers wearing army green around town, or when guarding the city, so it wasn't an attractive color to wear as a civilian. Now, that I've been away from that environment for 20 years, I've found a new meaning for army green or even camouflage print. I have a trench coat in that color, which I love. 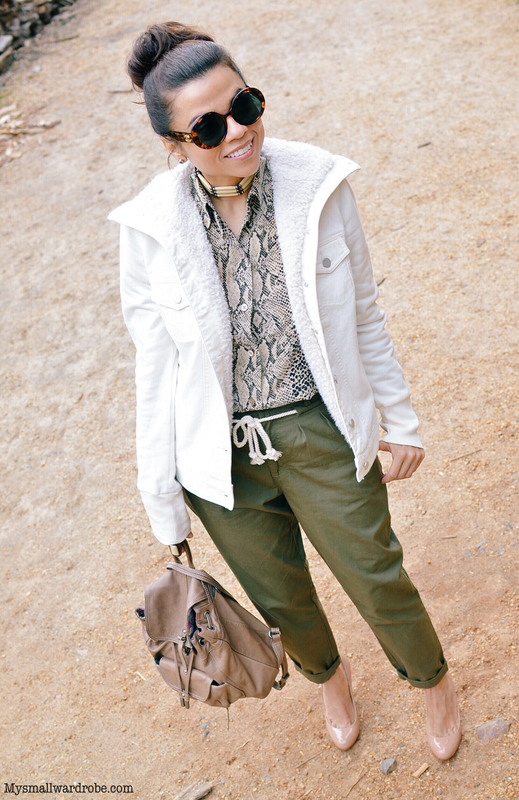 I also have a utilitarian parka and now these pants, which have a safari/army vibe. Today, I'm also introducing my new parka denim jacket, which I found a few days ago while out and about in Raleigh, NC. I've been looking for a shearling jacket that wasn't too heavy and that I could even wear at the beginning of spring time. 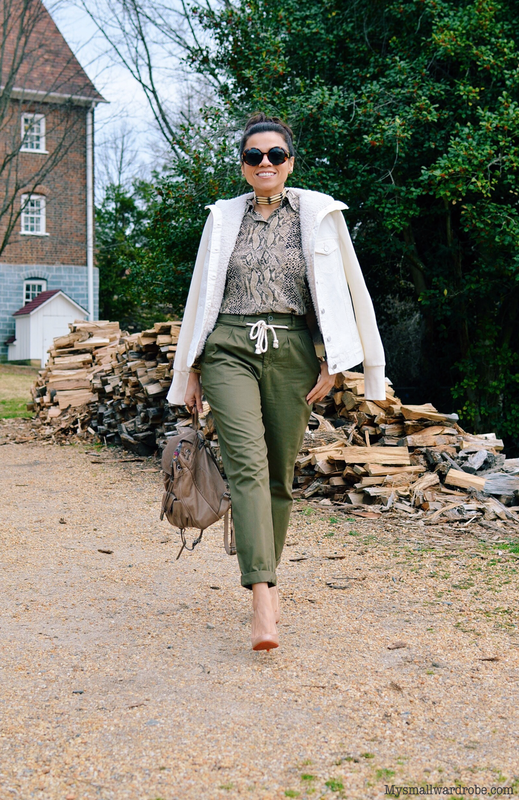 Every one I tried on was very heavy and perfect for really cold weather cities, however, living in North Carolina, I don't need too many heavy coats to get by our mild winter season. 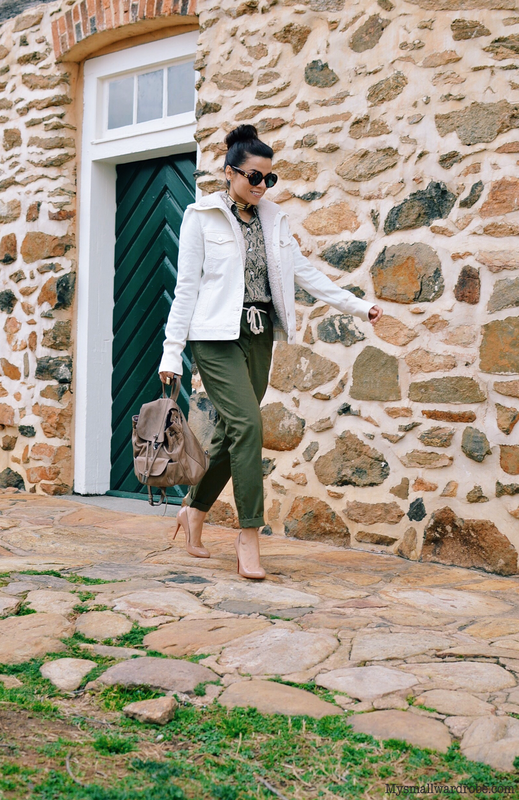 Early in this week, I decided to put these two items together and style them with other neutral pieces in order to achieve a look with an earthy vibe. I was really tempted to style them with one or two colored pieces, however, I also was craving for a look with colors easy-on-the-eye. Hoy, yo también les estoy enseñando mi chaqueta nueva con piel de oveja, que encontré hace unos días cuando andaba en Raleigh, Carolina del Norte. Ya hace mucho tiempo que estado buscando una chaqueta de piel de oveja que no fuera demasiado pesada y que incluso la pudiera usar al inicio de la primavera. Todas las que me he probado han sido muy gruesas y perfectas para ciudades con fríos muy exagerados, sin embargo, ya que vivo en Carolina del Norte, yo no necesito demasiados ​​abrigos gruesos para sobrevivir en nuestra suave temporada de invierno. A principios de esta semana, me decidí ponerme los pantalones y la chaqueta juntos y los combiné con otras piezas neutrales con el fin de lograr un look de colores terroso. Me dio la tentación de ponerme una o dos piezas de colores, sin embargo, también apetecía un conjunto con colores fácil-al-ojo. They are classic! You should ;-) Thanks Allison. That was exactly my thought when I saw it for first time. Thanks!